Yes, I said it. I’ve decided to try cloth diapering! To many, this may seem like an easy feat… no big deal. But, I’ve never loved doing extra laundry, and the idea of scraping poo off of a diaper repulses me. So, why am I doing it? Well, when I had baby #1 I thought about it, but never took the leap. All the reasons were there to try it – better for baby, better for the environment, better for the pocketbook. But, I knew that I’d be going back to work at the end of the year and figured it would be too much for the daycare to deal with (kinda a cop-out, right?). So, now things are a bit different. I’m home full-time now that baby #2 has arrived and really can’t justify NOT trying it. I mean, what do I have to lose? Especially now that I’ve discovered a super-economical way to try cloth diapering (or CD’ing, as it’s referred to). Try to get them for free (yes, it can be done) or gently used for cheap. 1. Find companies that will give you free products for testing/evaluating them. I got my first cloth diapers by registering to be an evaluator for a company called PTPA (Parent Tested Parent Approved Media). It’s a fantastic concept – parent testers evaluate various products and, if the products receive positive evaluations, they are awarded the PTPA Seal of Approval. The great part? Evaluators get to keep the product(s) they’ve tested (it’s a win-win for everyone!). I was chosen to evaluate some cloth diapers and was sent two to test out. 2. Do some research, talk to friends and family who use cloth diapers, and find out about the various cloth diaper companies out there – there are a ton of brands and styles (pockets, hybrids, all-in-ones/AIOs, etc.). Then, check to see if any of them have Facebook or Twitter fan pages. Contests are big draws on these pages, so you can score free stuff relatively easily. I really loved the products I tested out for PTPA, and searched out the company who made them – in this case, Charlie Banana. I “liked” them on Facebook and they happened to be running a great contest, giving away a diaper a day for the entire month. I entered and won! At this point, I was up to three diapers – all of them free!! After using these for a few weeks, I started to think I could actually do this cloth diapering thing. It wasn’t so hard… and baby had no rashes or irritation at all – unlike my usual experience with disposables. 3. 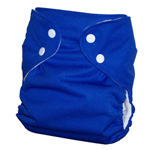 Visit diaper swapping websites – forums for swapping or selling new or gently used cloth diapers. There is practically a CD’ing universe out there, with its own lingo and a great sense of camaraderie. My fave site is diaperswappers.com – it rocked my CD’ing world!! You’d be surprised how many mamas buy different brands / types of diapers to try out and decide they don’t like them after only a few uses, so you can get them for a steal. There are various forums, each dedicated to a different type of cloth diaper, and lots of support / information forums for us newbies, too. I’ve already bought diapers from three mamas (and love them! ), and am thoroughly happy with my choice to CD. I would highly recommend trying this… helping the planet is a great legacy to leave our kids. Found your blog via Charlie Banana's facebook! @Rachel – I have some BGs, too, and love them! There are so many great diaper brands around! Stay tuned as we'll be having some great giveaways soon!